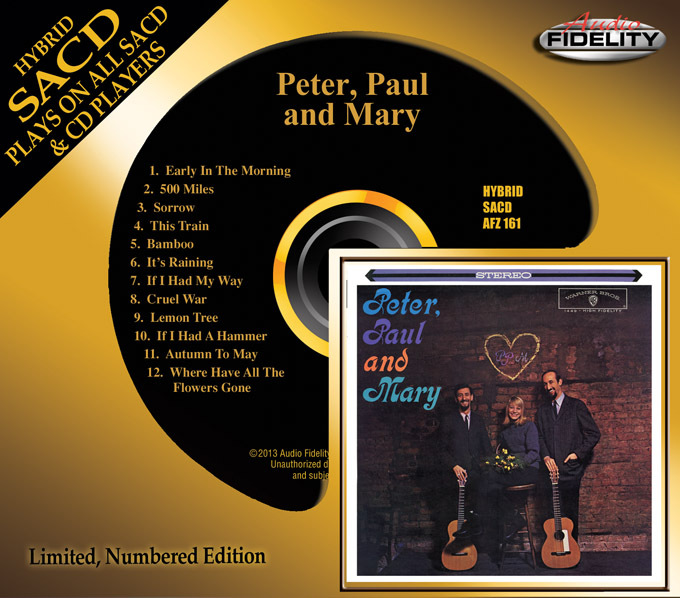 Camarillo, CA – The group that transformed American folk music into ’60s pop, legendary Peter, Paul & Mary’s debut 1962 self-titled album will be released on Hybrid SACD by Marshall Blonstein’s Audio Fidelity on March 4, 2014. One of the best albums to come out of the 1960s folk music revival, the trio’s debut release featured two of the biggest folk hits of all time, “Lemon Tree” and “If I Had A Hammer”, along with such classics as “500 Miles” and “Where Have All The Flowers Gone.” Peter, Paul & Mary’s first album introduced one of the most popular, innovative and enduring folk music groups of all time! ‘Peter, Paul & Mary’ is a collection of the best songs that the group knew, stirring in its sensibilities and its haunting melodies, crossing between folk, children’s songs, and even gospel; light-hearted just where it needed to be and earnest where it has to be. For a young group on their first album, this was meticulously produced and already showed their incredible sense of professionalism. The angelic voice of Mary Travers blends with Peter Yarrow’s tenor and Paul Stookey’s bass on some gorgeous harmonies. It’s one of the rare folk albums to reach US #1, staying in the Billboard Magazine Top Ten for 10 months, including seven weeks in the #1 position. At the Grammy Awards of 1963, their recording of “If I Had A Hammer” won the Best Folk Recording and Best Pop Performance by a Vocal Group awards. This classic recording helped to bring modern folk stylings to a mass audience for the first time. The album’s innocent good spirit and optimism remains infectious even 50 years later!